Salt Lake City – The 51st ranked University of Utah men’s tennis team (14-7, 2-4) fell to the 3rd ranked UCLA Bruins (18-2, 5-0) on Friday 4-0, and the 2nd ranked USC Trojans (23-2, 5-0) on Sunday 4-1. The Utes and Bruins battled for the doubles point. UCLA and Utah split at No. 1 and No. 2 doubles, but UCLA’s tandem of Brymer/McDonald narrowly defeated Utah’s Cowley/Medinilla 8-7(5) at No. 3 doubles, thus clinching the doubles point for the Bruins. In singles play, No. 62 Karue Sell beat Devin Lane at the #5 position, 6-2, 6-1. Cedric Willems fell to No. 92 Gage Brymer at the #5 spot, 6-0, 6-3. No. 3 Marcus Giron clinched the match for the Bruins after defeating Ben Tasevac 6-3, 6-2 at the #2 position. The remaining matches were suspended because the match was decided. 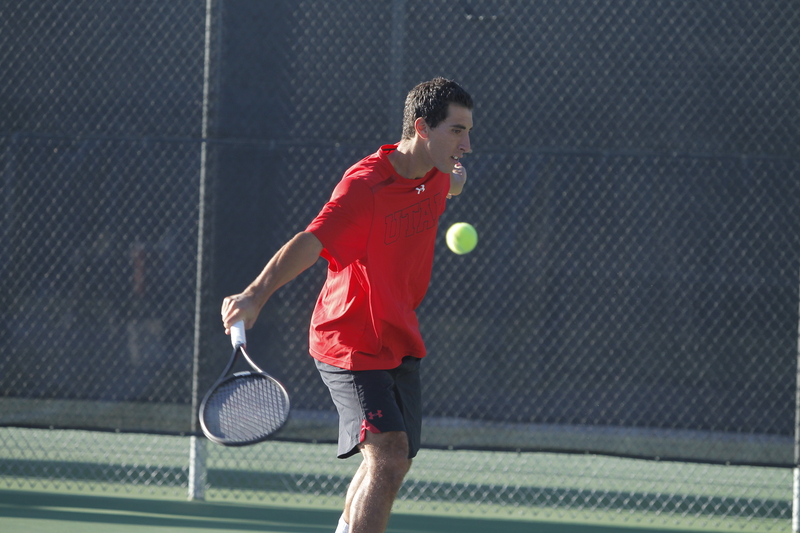 On Sunday the Utes dropped the doubles point to USC, losing at No. 2 and No. 3 doubles. The Trojans increased their lead to 2-0 after #94 Eric Johnson defeated Cedric Willems 6-2, 6-1 at the No. 4 position. In the first singles slot, Slim Hamza tallied the first point for Utah in a historic upset, winning over #7 Raymond Sarmiento 6-0, 6-2. Matt Cowley fell to #45 Johnny Wang at the No. 6 position and #17 Roberto Quiroz clinched the match for the Trojans after beating Senior Ben Tasevac 6-2, 6-4. Because the match was decided, the remaining singles matches were abandoned. Utah will wrap up regular season play on Friday vs. Arizona in Tucson, AZ. This entry was posted in Schedule/Results and tagged Alejandro Medinilla, Ben Tasevac, Cedric Willems, Devin Lane, FD Robbins, Matt Cowley, Pac-12, Roeland Brateanu, Slim Hamza, UCLA, USC, Utah Tennis, Utah Utes. Bookmark the permalink.